I’m both excited and annoyed about the prospect of rum becoming the new bourbon. In recent years, bourbon shortages have driven up prices, as demand has shot up for high end, well-aged, limited-release bourbon. The plus side of that scenario is more good rum on the market. The downside, of course, is higher prices and standout releases becoming increasingly tough to find. For example, I’ve already heard Foursquare referred to as the “Pappy of Rum,” which isn’t good for rum drinkers considering the price and exclusivity of Pappy. That said, it isn’t hard to see why Foursquare is so highly regarded. The Barbados-based distillery uses traditional distilling methods, innovative cask usage, and an unadulterated (without added sugar) style. 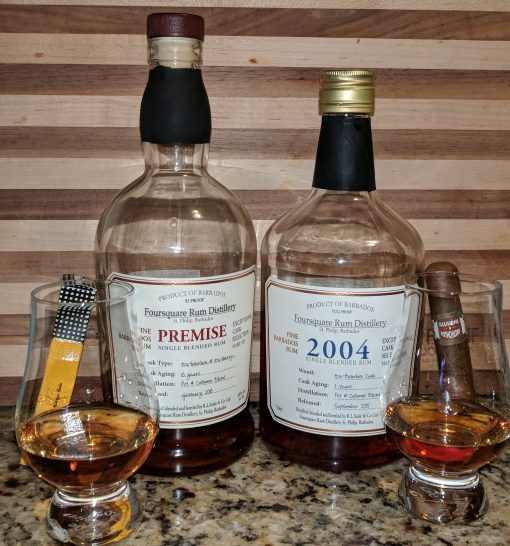 The Foursquare 2004 Single Blended Rum and Foursquare Premise Single Blended Rum each show off what makes Foursquare a standout for many rum lovers. Prices vary for each, if you can find them (the 2004 will be particularly hard to find), but expect to pay $60-90 for each. These are two great rums, each elegant in their own way, and both perfect pairings for a fine cigar. Personally, I prefer the intensity of the higher-proof 2004, but Foursquare Premise is also one of the best ten or so rums I’ve ever enjoyed. Pair each with a good cigar and you’ll be in for a treat. Foursquare 2004 can stand up to the strongest full-bodied cigar like the Bolivar Royal Corona, Drew Estate Liga Privada Único Serie Velvet Rat, or Litto Gomez Diez Small Batch. Foursquare Premise pairs excellently with a balanced, medium-bodied cigar like the Paul Garmirian Reserva Exclusiva, Tatuaje Black, Warped Futuro, or Davidoff Colorado Claro.